C/w FOC NEW Pro-Line True Colour welding helmet (ENG936T) & Pro-Line MIG welding gauntlets (ENG3825). Items will show as FOC on your basket when adding the MP201 to your basket. Set up the machine with minimal effort – simply select your process, gas, material thickness and wire size and the machine automatically sets to the correct parameters for your job. You can then make adjustments using the control knobs on the front. Image on screen shows how the machine should be set up correctly for the process selected. Help section provides easy reference guide for replacement machine parts and torch consumables. Multi-lingual, the MP201 has instructions in 6 languages including English, French, German, Spanish, Swedish & Polish. The X-Pert MP201 is able to cope with inputs which fluctuate by +/-15% and can be used with the majority of generators. The machine is housed in a metal case with integrated carry handle. 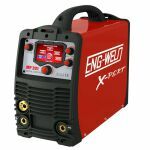 Dual voltage multi-process mig welder with digital interface, ideal for maintenance and multi process application. The Control Handle allows the user to control welding machine parameters directly from the torch handle. Control Modules are available in 2 and 4 Button versions, and can be assembled to the handle in seconds. The Control Modules are powered by the native control voltage of the power source through the existing trigger wires, so no additional wiring or connectors are required on the power source. When a button is pressed it returns a unique voltage back to the machine. The power source uses simple logic to act on the return voltages being received. For control buttons to function, the power source must have the control logic built in.